We have some new classes and some new samples in the shop - lots of fun! Please stop in and see them - we will be happy to give you information on them. We hope you have checked out out new website - we are so pleased with it! Saturday, September 23: Ruler Club meets from 1 – 3 to play with rulers! It is open to anyone using, or interested in using, rulers and templates for free-motion quilting. Michelle will demonstrate Corner Mark Circles and a wreath design. If you are curious about quilting with rulers, this is a chance to see it in person. If you have some templates and some questions, bring them along. You may bring your machine to try out different techniques or templates, or just come watch. Friday, September 22: Forest Floor BOM begins. We still have a few openings, so if you are interested, call or stop by. Monday, September 25: Fat Quarter Club meets from 11 to 3 every month. They are winding up a project, and will be making plans for what to do next. If you are interested in working on small projects as part of a group, this might be the group for you! Like all our clubs, it is open to new members. Please come in if you are interested. Thursday, September 28 – Saturday, September 30: Our Judy Neimeyer retreat. Judy Bowers, a Certified Instructor, will teach the retreat – the gorgeous Vintage Rose. We have the sample quilt in the shop – it is so beautiful! Participants can set up Wednesday, so that they are ready to begin work first thing Thursday morning. We are extending registration so that anyone who has just realized they can fit it into their schedule can still attend. Call the shop for more information. Note: As with all our classes, there is more information on our web-site, or you may call the shop (501.318.2739) for more information. Remember, that you are not enrolled in a class until you have paid the class fees. All classes have a minimum and maximum number of participants. If the minimum is not met prior to class starting, the class will be cancelled, and fees returned to those who have already paid. Saturday, September 30: To celebrate the last day of National Sewing Month, we have a day of demonstrations – and a sale! First, you can make your own themed FQ bundles. Choose your theme, select your FQ's, and get the bundle price. Also, Amy will be there to show you how to fold your FQ's into star and Christmas tree shapes – wonderful gift ideas. We will also be demonstrating the new Quilters Select Rulers, so you can see for yourself how terrific they are. Last, we will be showing how to use the really fun mirrors used for Stack 'n Whack design. And, the “sale” part – all Christmas fabrics will be 15% off, and all autumn and Halloween fabrics will be 10% off. We LOVE National Sewing Month! Looking ahead, Michelle has some people interested in another Beginning Quilting Class. If you know of someone who might be interested, please have them call or come by. We don't have quite enough signed up to make a class yet, but the few we have really, really want to have it this fall! Many of you will remember the days of Stack 'n Whack – would you believe it, it is coming back around? And a lot of us are delighted because we didn't learn how to do it back in the day, and would love, love, love to try it now! Cheryl White, whom many of you will know from the Village Quilt Guild, has agreed to teach an beginner class on Tuesday, October 3,and an advanced class (also known as a One Block Wonder) Monday, October 23. We are happy to welcome her as a new teacher for us. Call the shop or check the website for more information. Amy and Barbara will be kicking off a professional embroidery business in the shop in the very near future. 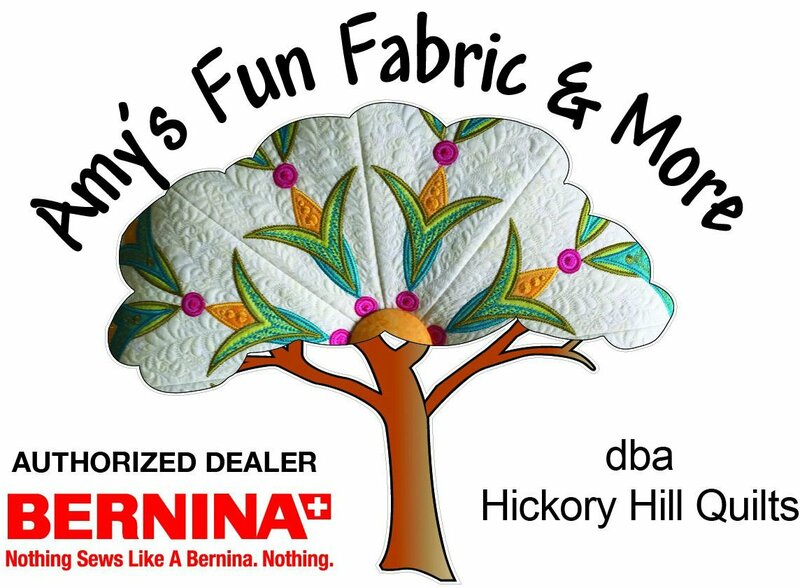 We just got a Bernina 16-needle embroidery machine (and we will be selling and servicing them, too), and it will be put to work. Amy is in Chicago this week for training - learning lots!